I am both delighted, proud and humbled to receive the Norway National Award for the best single image – across all ten categories – in the Sony World Photography Awards 2016, the world’s biggest photography competition. As a photographer devoted to conservation and nature, I am especially glad that such recognition is given to a wildlife photograph taken in Maasai Mara in Kenya, one of the world’s greatest wildlife heritage. 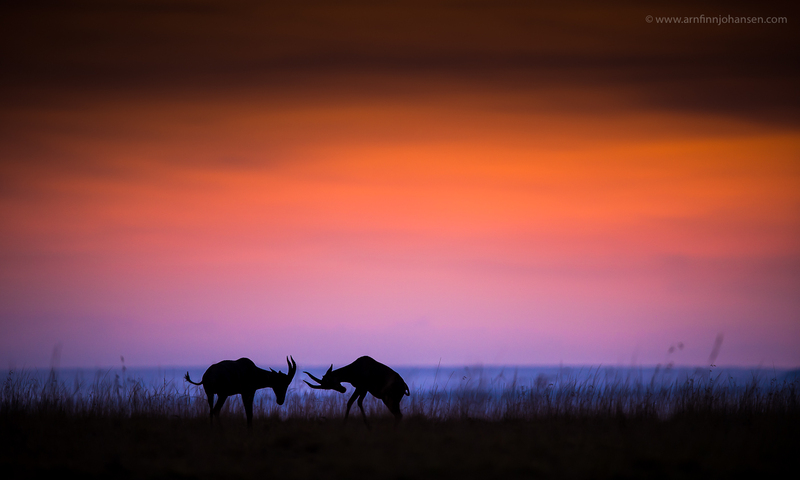 The image shows two adult Topis fighting over females and territories on the high plains before sunrise. It is also a honor that my image will be on display at the Sony World Photography Awards Exhibition at Somerset House, London from 22nd April – 8th May. I am also thankful for and looking forward to be flown to London to attend the Gala Ceremony on 21st April, and to receive the price; the latest Sony digital imaging equipment. Especially for remote controlled wildlife photography it will be interesting to experience the benifits of Sony´s high end digital camera, and what advantage a mirrorless camera can give me. The winning image, posted below, is also commended in the Nature & Wildlife category. Click on the image to enlarge and see it in 1400px quality. Feel free to leave your comments below if you like and do follow my work on Facebook as well. 1st Place and National Awards Winner at Sony World Photography Awards 2016. Hi Arnfinn, congratulations with this outstanding result ! I see how and why you took away the overall 1st place, because this is just an iconic picture ! Great work, keep it up. Classic story about the life on the only planet we share!